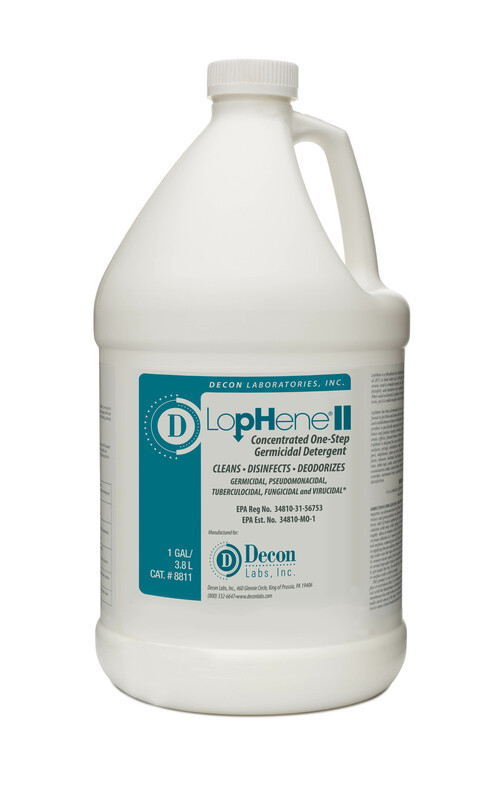 LopHene® II Concentrated Phenolic Disinfectant is a low-pH (acidic) germicidal cleaner for use on hard surfaces in labs, production areas, and on process equipment or anywhere thorough disinfection efficacy is required. Diluted one ounce per gallon of water (1:128), LopHene II is a biological decontamination product and disinfection. It is effective against a wide range of bacteria, viruses, and fungi, including TB and HIV-1. High soil-load and hard water tolerance. LopHene II can be alternated with Cidecon if a rotational disinfection program is desired or where organism resistance is suspected. Conforms to OSHA’s Blood borne Pathogens Standard. EPA registered.